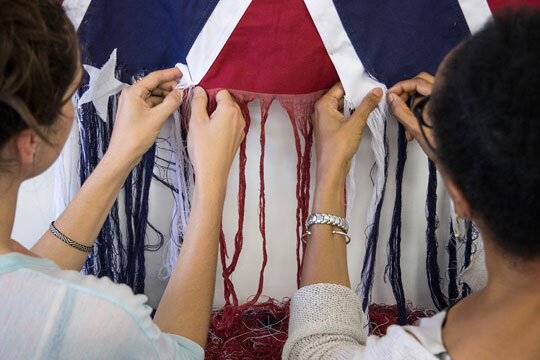 70" x 36" x 7"
A performance with partially deconstructed cotton Confederate battle flag, threads, and shelf. 10" x 36" x 7"
Completely unraveled 3 by 5 foot cotton Confederate battle flag and shelf with threads segregated into red, white and blue. 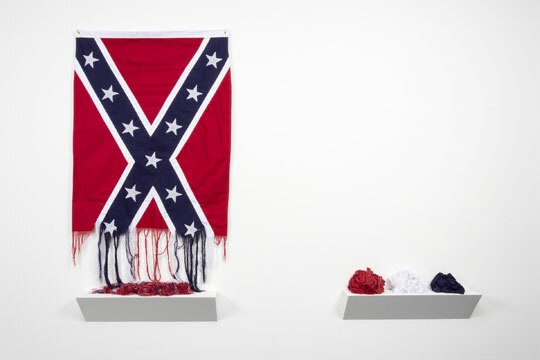 Sonya Clark, Unraveling (left) and Unraveled (right), 2015 to present. Over 250 people have stood shoulder to shoulder with the artist to unravel the contentious flag. It's a slow, arduous, endless task. First performed in NYC in 2015 (9 days before the South Carolina murders) and subsequently at the Speed Museum, Nasher Museum, Pennsylvania Academy of Fine Art, Mead Art Museum and other venues. To mark the 150th anniversary of the end of the Civil War, I completely unraveled the Confederate flag over several months in Richmond. I kept in mind the legacy of lynching, mass incarceration, and the 13th amendment as the country witnesses ongoing racial injustice. 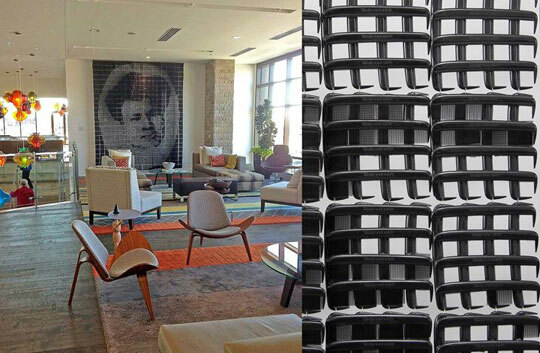 The Alexander Hotel, Indianapolis, IN. Sonya Clark, Madame CJ Walker, 2013. 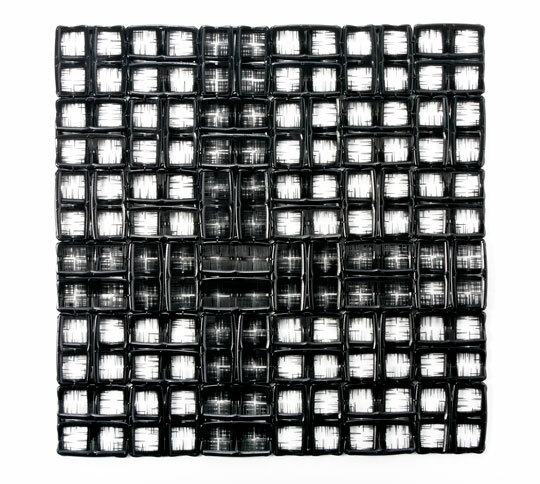 Sonya Clark, Albers #1, 2013. 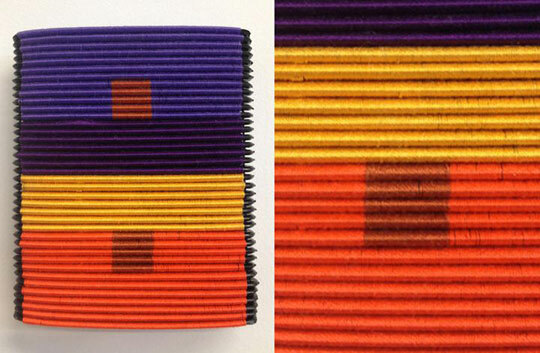 Sonya states, "The Comb Series is concerned with the meaning in the materials. It employs a material culture perspective. 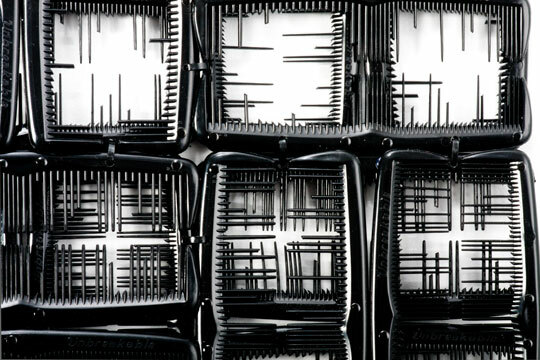 The black plastic combs evoke a legacy of hair culture, race politics, and antiquated notions of good hair and bad hair. What type of hair would easily pass through these fine-toothed combs? What does it mean that the combs themselves are arranged into tangles like felted dreadlocks, neat curls, and wavy strands? Combs imply order in as much as they are tools that organize the fibers we grow. They suggest thorough investigation as in “to go through something with a fine-toothed comb.” When a comb has broken or missing teeth there is evidence of struggle. The missing teeth provide a new rhythm, the music of a new order." 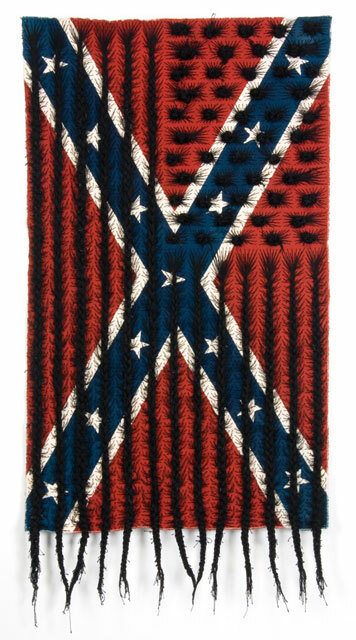 Sonya Clark, Black Cross Worn Thin II, 2012. Detail - Black Cross Worn Thin II. 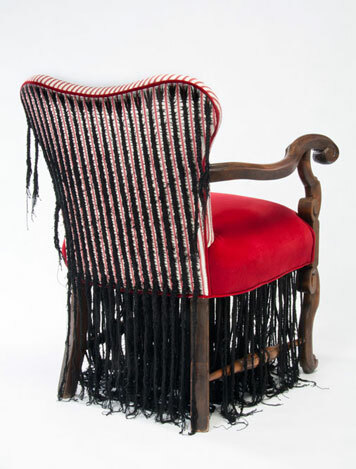 Sonya Clark, Untitled (Cornrow Chair), 2011. 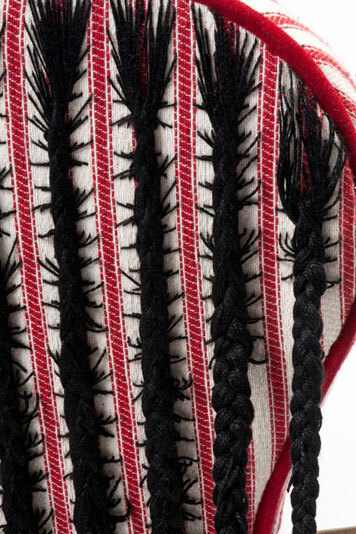 Detail - Untitled (Cornrow Chair). "Cloth speaks and so does hair. 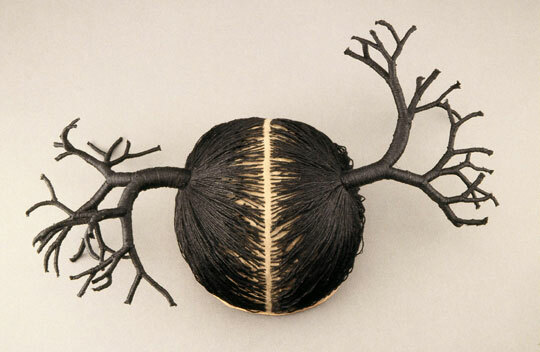 Like textiles, hairstyles express politics, heritage, and culture. This piece juxtaposes the two. The traditional African American Hairstyling techniques of cornrows and Bantu knots become the stars and stripes of the American flag against a backdrop of the Confederate flag. And so these complicated histories coincide. This work was inspired by Eastman Johnson's 1862 painting, A Ride for Liberty-The Fugitive Slaves. Johnson was one of very few American painters in the time period to depict this complicated history." Sonya Clark, Black Hair Flag, 2010. 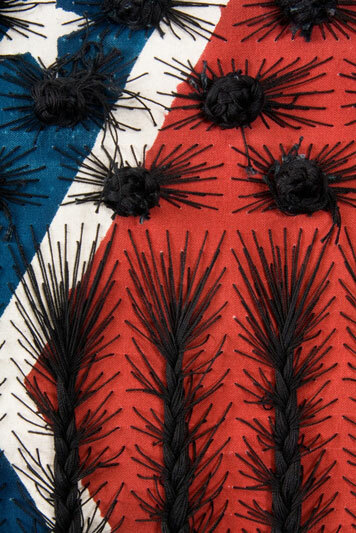 Detail - Black Hair Flag. 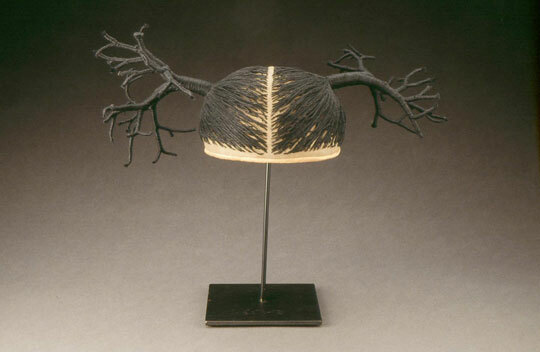 Sonya Clark, Two Trees, 2002.